Vigo is the gateway to Santiago de Compostela, the most venerated shrine in all Europe during the middle ages. The catherdral still draws thousands of daily visitors today. The largest city in Galicia, enjoy fabulous views over the bay and samples some local delicacies. Santiago de Compostela is the capital of Galicia, Spain and is one of the most important places in Catholicism. The city is dedicated to honouring St. James, one of the twelve Apostles of Christ. The cathedral was built in honour of St. James and in the destination of the 9th Century medieval pilgrimages known as the "Way of St. James." 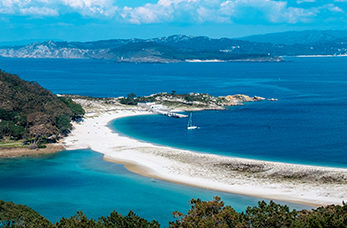 Cies Islands were declared a Nature Preserve in 1980, and are part of the Galician Atlantic Islands National Park. This tourist town with a medieval historic centre is situated by the outlet of the Vigo Bay. Explore the replica of Columbus’s second biggest ship anchored in the port. An ancient town and medieval port in the north-west of the Iberian Peninsula features an old town, a market and a promenade. A museum located at the crypt that displays a collection of tapestries and archaeological pieces. Sample the Albarino grape variety of several noted estates. White wines from the heart of Galicia's Albarino wine country have risen to international acclaim amongst wine aficionados.